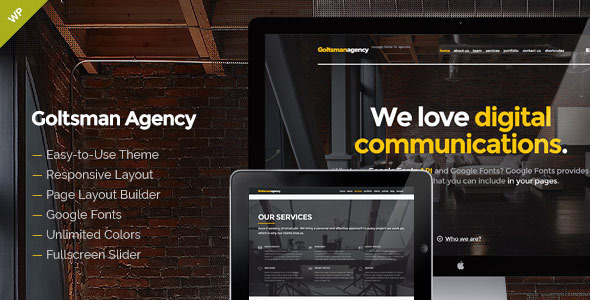 Goltsman Agency – is the pixel perfect responsive and Multi-Purpose One Page WordPress Theme based on Twitter Bootstrap Grid System. Theme includes easy-to-use Layout Builder, more 60 animation effects, beautiful blog design, parallax backgrounds, carousel slider, Google Fonts, unlimited colors and more. You can use it for: personal portfolio, photography studios, creative agency, design studios, model agency, design studio, freelance portfolio and etc.